Dutch prime minister Mark Rutte has described his Tuesday morning breakfast talks with his British counterpart Theresa May as a ‘useful dialogue’ in which the two leaders ‘discussed the latest Brexit developments’. May is on a whirlwind tour of European leaders to gather support for further changes to the deal paving the way for Britain to withdraw from the European Union, after deciding to postpone the key British parliamentary vote. 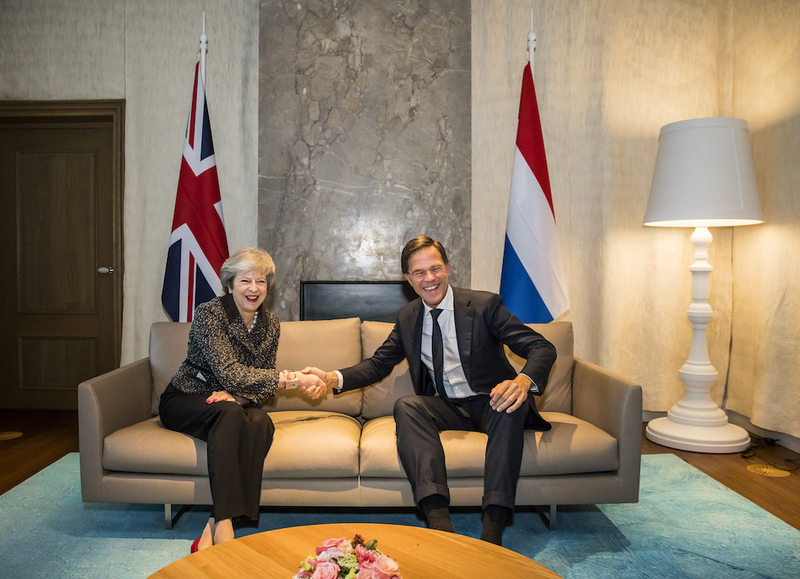 The Netherlands was May’s first port of call on the tour. She is in Germany this afternoon and then possibly Brussels. Rutte declined to comment on the talks as he arrived at the Catshuis – his official residence in The Hague, by bike for the meeting. Waiting reporters were also amused by the name of the catering company supplying the breakfast. Rutte has said repeatedly that the 27 EU member states are united in their approach to Brexit and reiterated last month, after the deal was signed by EU ministers that it is the ‘best we can get’. On Monday the national audit office said that a no-deal Brexit would cost the Dutch government €2.3bn over two years in extra EU contributions and customs services. Trade with the UK is estimated to be worth €22.7 billion a year to the Netherlands, equivalent to 3.1% of GDP. This makes the Netherlands one of Britain’s biggest European trading partners.